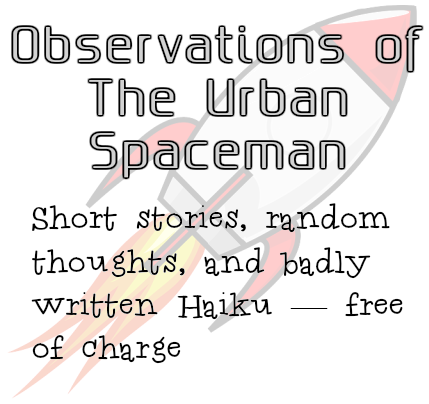 Observations of The Urban Spaceman | Watching the Earth. Not here to conquer. Promise! “How do I look?” Charlotte asked her most trusted aide. I ran my thumb along the grip of the pistol holstered at my hip. Reynard had asked for parley, but that didn’t mean others wouldn’t try to take advantage of the moment. My fellow sorcerers weren’t known for their restraint. The trembling aspen watched from a distance as the sharp teeth of a chainsaw cut cruelly into the weathered bark of the old sycamore. Trunk was reduced to stump; branches, to twigs. Sawdust bled onto bare ground before being borne away by the cold caress of winter zephyrs. Nearby, grey smoke puffed out from the chimney of the cabin, curling towards the heavens, and the aspen knew the time would soon come for its own spirit to dance on the east wind. This story by James, of Powered by Robots, inspired me to take part in this week’s Friday Fictioneers challenge, hosted by Rochelle Wisoff-Field. I went in the opposite direction to James, and saw something grim in the fallen tree. You can read other stories for the prompt by clicking the frog. The picture is copyrighted to Rochelle Wisoff-Field.